Sharpening helps your picture have a little more punch and can allow details to pop and draw attention. If you sharpen the entire image, however, you’ll end up with visible details, called artifacts, in places where there aren’t details, like a blue sky. To avoid creating these artifacts, you can sharpen only those areas that have interesting detail and those to which you want to draw attention. Let me show you how to selectively sharpen using Lightroom’s Adjustment Brush on this photograph I made in San Antonio on a photowalk (we’ve got another photowalk coming up in Las Vegas on February 8th). Because the sky was so bright, and the sun wasn’t shining on the steeple, yet, I shot a bracket of exposures and used Photomatix to put them together into an HDR. Since I was hand-holding the camera for the bracket, I used ISO 1600 so I’d have plenty of shutter speed to make a sharp picture. The trade-off is that there’s a little bit of noise in the whole picture, which I don’t mind at all because it’s not visible unless you zoom in really close. But if I sharpen the whole photograph at once, I’ll be enhancing the noise in the sky, and I don’t want that because then it will become visible. Start by opening the Adjustment Brush. Press the letter K, or go to the Develop Module and click on the brush icon under the Histogram. Press the letter O to activate the Overlay so you can see your brush strokes; pressing O again hides the Overlay. Next, check the box that says Auto Mask at the bottom of the brush panel, or the letter A. With Auto Mask activated, the brush will only affect things that are the same color and tone as the area under the center of the brush. You can see that even though I used a very large brush to paint on the steeple, only the steeple is affected because I kept the center of the brush on the steeple. 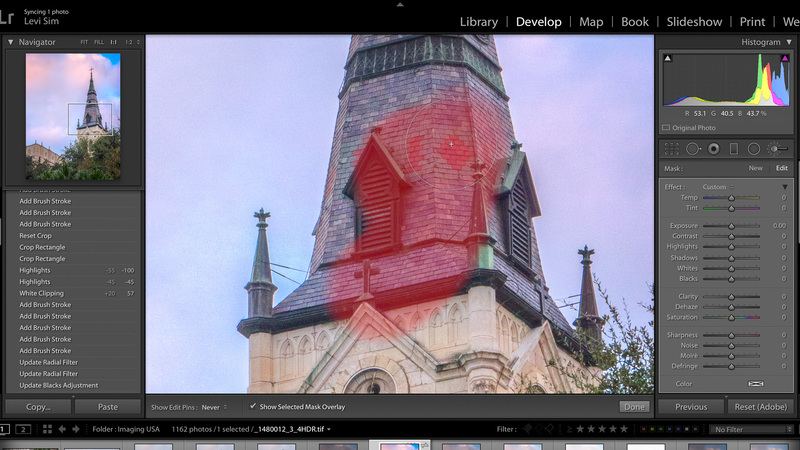 It’s markedly darker than the sky so Lightroom has an easy time separating the two. Your mileage will vary on different subjects, but it’s a terrific feature. Now just paint the subject. You don’t have to be totally exact when sharpening, so don’t worry about the area of the building behind the trees. When you adjust Sharpening Slider in the brush panel, be sure that you zoom in to view the photo at 100% first. Only at 100% can you see the complete effect of sharpening. If you view from farther away you’ll probably overdo it. 35 looks pretty good for this photo. Since you’ve painted with the brush, there may be other effects you’d like to apply, too. I’d recommend creating a second brush overlay for those effects os you can keep them separate from the sharpening. Just right click on the brush button and choose duplicate. I ended up increasing the whites and the clarity a little bit for more pop. As you can see, the Adjustment Brush is simple to use allows you to apply specific effects, like sharpening, to only the most important areas of a photo. It’s a great way to sharpen selectively and will help you direct the viewer’s attention in your photographs. Excellent, I will use this technique going forward.